This summer, THE MARINE’S LAST DEFENSE is a featured book in a Harlequin campaign. Hashtag #WhateverYoureInto includes two fun videos and the #DateDitchMarryGame. After only one week the video had over a million views. It’s fun and over-the-top and whew…I have read several books that make me feel this way. Personally, I love being a part of the campaign. I feel very honored. Fingers crossed that viewers see or remember my name or the book (or maybe even buy it). To the rest of the world, Sabrina Watkins doesn't exist. But to this cop, she is very much alive. After escaping a killer, playing dead was the only way Sabrina Watkins could get out of Amarillo alive. Now she's living in Dallas, where no one knows her true identity. Until homicide cop Jake Craig shows up. A half-frozen pup he finds at a crime scene brings Jake to Sabrina's doorstep. Suddenly, the former Marine is playing hero to a desperate woman on the run. Sworn to clear her name, Jake's already falling for the stunning brunette with the amethyst eyes. Can he keep her safe and turn a rescue mission into a last chance at love? 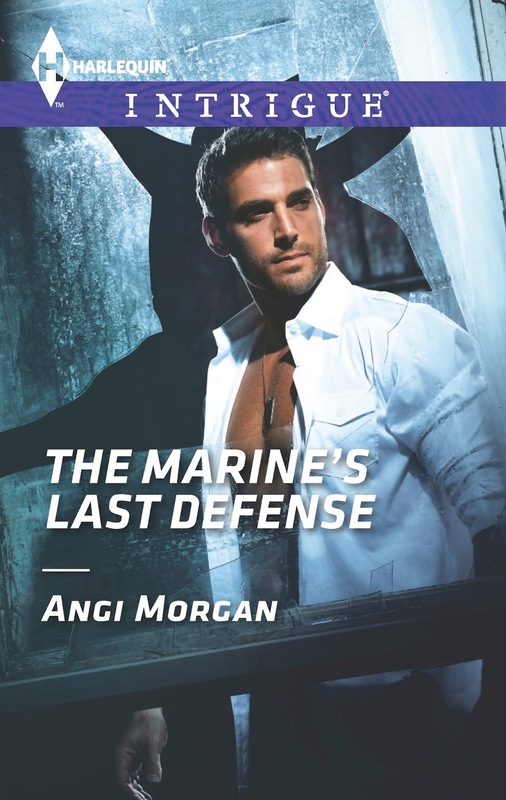 Catch additional features on THE MARINE’S LAST DEFENSE on JRS: Where the Characters Come From & Dallas Trouble. This is a special book for me in more ways than one. It features my handicapped pup whose life was cut short from a seizure. Reviews about the book included mentions about the pup Dallas’ character, PTSD and Pets for Vets. I loved Dallas very much and to have her book featured by Harlequin means the world to me. Leave a comment to be entered in the drawing for a Romantic Times Booklovers Convention KICKASS COWBOYS, COPS and KISSES tote with autographed books. DID YOU NOTICE the BOOK in the VIDEO? Giveaway is through Rafflecopter and ends on July 18th. Contestants who enter through the Rafflecopter drawing can register for additional chances. 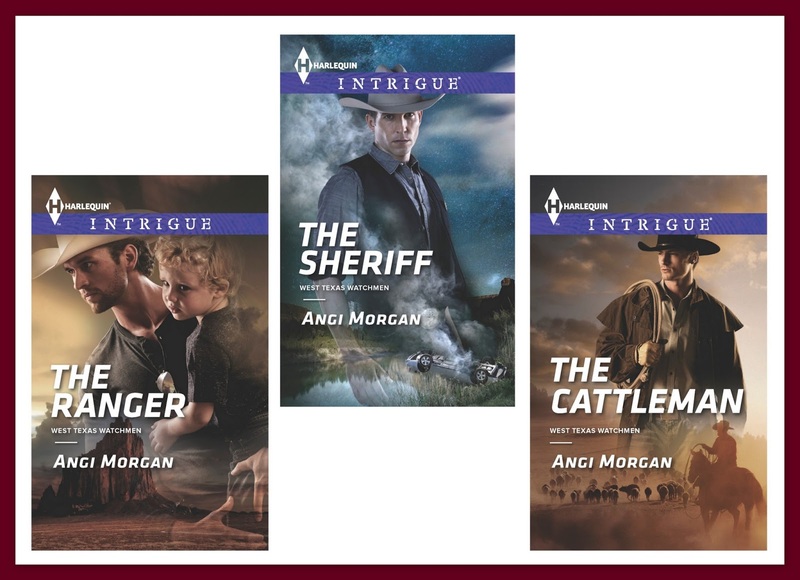 By leaving a comment on Just Romantic Suspense, Angi Morgan will enter you into the Rafflecopter drawing with one entry. Be sure to check out the JRS SHOWCASE for additional giveaways! Book sounds good. So sorry about your doggie! I have cats and it breaks my heart every time I lose one of them. Thank you for the giveaway! We help foster rescued labradors and see the difference between animals that stay animals or become family members. Debbie, you're my kind of animal lover !! The book sounds like a great summer read. Sounds great Angi...I love animals and I enjoy how much they can add to a story... I did notice the book in the video... big fan of cowboys and cops among other heroes. Jake is a detective, Marine, wounded hero Texan, animal lover. Angi, I want to win because I love Harlequin books. I miss your Dallas. She was such a beautiful puppy. It is a fun video. I'd love to add to my 'library' thank you.